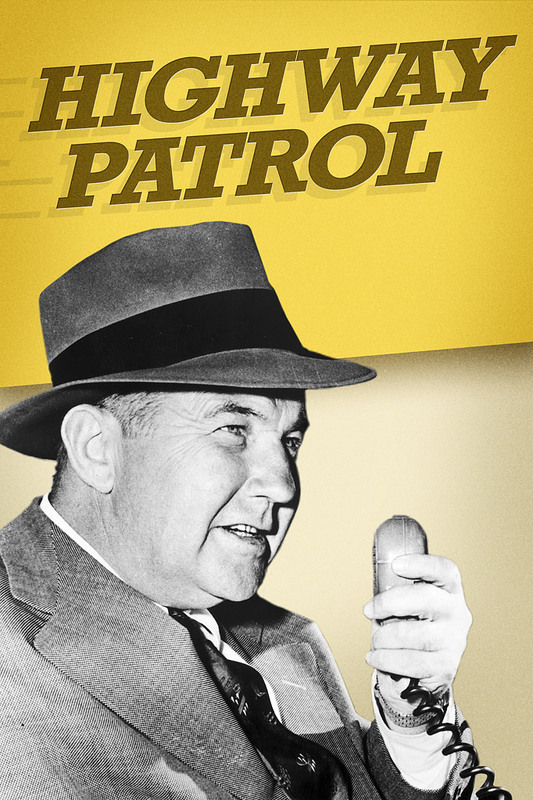 Highway Patrol starred Broderick Crawford as Chief Dan Matthews, the gruff and dedicated commander of a police force in a large, unidentified Western state, who is always in control and always at the scene of the action. The real California Highway Patrol provided technical assistance, and the Dodges and Buicks used as police vehicles were designed to resemble the then-current CHP fleet in both paint scheme and door insignias. The series was unique in that it used primarily location shooting - in rural and desert areas of southern California - in the still very studio-bound early years of television. Hot Dust: When a young laboratory worker accidentally exposes himself to radioactive isotopes, he panics. Then his mind snaps and he flees out of town. News of the freak accident reaches the public. Hysteria mounts. Witness Wife: Martin Jensen sees two men bury a body near his farm. Alarmed, he barely has seconds to phone the police before the two men burst into the farmhouse, brandishing revolvers. Dead Hunter: On a hunting expedition, William Foster shoots down his business partner to gain control of their company. Dan Mathews detects a false note in Foster's explanation of the 'accident'. The crime lab supports Mathews' theory. Dan and the officers corn. Convicted Innocent: Mathews discovers an innocent man serving a prison term for murder. Mathews obtains his release. The exonerated man is bitter. He hunts the witness whose mistaken testimony led to the conviction...and attacks the witness with intent to kill. Chain Store: A masked gunman holds up several supermarkets and makes a clean getaway. Chief Mathews ferrets out the bandits' mysterious method of operation and sets an unusual trap to catch him red-handed. Hideout: Highway Patrol Chief Dan Mathews receives a phone call - a young woman hysterically tells him she has killed a man. Rushing to the scene, Dan learns the woman has struck her victim - a 'wanted' thief- down in self-defense. Mother’s March: A hospital charity Committee collects over $10,000. On the way to the bank the Committee Chairman is attacked and robbed. Dan learns that only three people knew the committeeman's route - the victim, his wife and a local businesswoman. Slain Cabby: Using a squad of taxicab drivers as 'bait', Dan Mathews, lures two hold-up men out of hiding. Insulin: Panicked by a government investigating committee, a notorious crime syndicate makes a fatal mistake. The 7th Green: A 'wanted' criminal needs shelter at any cost. The Highway Patrol exposes one man more ruthless than his boarders who operates a professional hideout for criminals. Foster Child: Dan puts out an All Points Bulletin to catch an armed fugitive. Description: Male- 10 years old. Lady Bandits: Disguised as men, two girls stage a series of armed robberies. After each foray, they change to normal dress and slip undetected through Highway Patrol roadblocks. Tear Gas Copter: Three gunmen flee to a sparsely populated farm area where they slug the Highway Patrol Officer on duty and take a panic-stricken housewife as hostage. Dan swoops out of the sky in a helicopter to attack the criminals with tear gas. Deaf Mute: 12-year-old Susie Haskell can't hear or speak. When two thieves attack her father, rob his safe and take her as hostage, Susie is petrified with fear - unable to cry for help. Hit and Run: A panic-stricken hit and run driver, two thieves and a disappearing body create a unique mystery. Fear: The Highway Patrol pinpoints Keith Tobin as a thief and killer. Tobin panics, flees in his car. Chief Dan Mathews commanders a Highway Patrol car, follows in hot pursuit. Human Bomb: Jay Dederick, an unemployed electrical engineer, has brooded over losing his job at Roget Chemical Corporation until it has become an obsession. Convinced he was victimized by the company, he uses stolen explosives to convert his car into a giant bomb and heads for the city, determined to blow up the company. Dan learns of this suicidal mission only at the last moment. Several attempts to road-block this careening four-wheeled bomb fail. Finally, with all available Highway Patrol units utilized at road-blocks, which Dederick has by-passed, Mathews find himself the last unit between Dederick and the city. Lookout: Though innocent of involvement, Joe Bradshaw happens to be in the company of the Fowler Brothers when they hold up a diner and murder its proprietor. He flees in fright. Fear of the police, compounded with an even greater terror of the vengeance he may expect from the Fowlers, drives Joe to attempt to get out of town. Both Dan Mathews and Tom Fowler conduct a simultaneous search for Joe. Before the story has run its course, one man is dead, two are critically wounded, and Joe - who a few short hours earlier had been Mr. Average-law- abiding Citizen, is harried to the point where he is willing to shoot it out with the police. It is Dan Mathews who manages to show Joe the error of his ways. Gambling: The Club Bahamas, an illegal gambling house, has defied all efforts to close it by the local sheriff, so he makes an appeal to Dan for help. Hitchhiker: An unidentified man picks up a hitchhiker, a migrant worker, kills him with a tire iron, plants false identification on his body, and then wrecks the car to make the hitchhiker's death appear to be accidental. Doctor's report to Highway patrol indicates murder. Mathews, in checking, finds five similar "accidents". Dan suspects an insurance pay-off racket. After following several blind leads, Mathews traces unofficial post office for migrant workers. All evidence points to the guilt of an ex-con, Hank Willis, but Dan exposes the real killer and after a chase, apprehends him before he commits a sixth murder. Released Convict: Nailor had served his time for a half a million dollars armored car robbery. The money had never been found. After his release, Nailor drives to the Smokey Hills area to get the money from the place where it has been buried. Nailor is tail-wise and knows that he must assume that he will be tailed. The Highway Patrol has to follow this by (a) having strategically placed patrol units accomplish this by having them on the route that lies ahead of Nailor's car report his direction from concealed positions and (b) by planting an ultra high frequency transmitter on Nailor's car so that its progress can be triangulated by radio stations by the Highway Patrol. Radioactive: A thief steals a piece of oil research equipment which contains radio- active elements. Reformed Criminal: Frank Wood, a Farmer's Cooperative, is reported missing while trans-porting a large sum of the firm's money. Dan Mathews discovers Wood to have a criminal record. Road blocks are set up on the natural assumption that Wood is still a thief. Actually Wood succeeded in rehabilitating himself. He is overdue because of a tire-blowout and crash. Frank's efforts to prove his innocence are blocked by Mathew's persistent search for what appears to be a dangerous criminal. At the last moment, Mathews takes a heavy personal and professional risk to allow Wood to prove his rehabilitation. Father Thief: Young Grant Elliot, stopped for speeding, panics and accidentally runs down the patrolman when the latter grows suspicious of a lot of automobile accessories in the car. Decent instincts cause the lad to drive the officer to the hospital, saving his life and winning the sympathy of Dan Mathews. Mathews is subsequently shocked when Grant, through the car, is linked with a number of recent thefts of auto goods, and is arrested. Mathews, suspecting that the guilt lies with the father and that Grant is protecting him, makes a painstaking investigation that clears the boy and convicts the cowardly father. Hot Rod: Dan Mathews puts the brakes on high-speed death, when he tracks down hot-rod killers. Retired Gangster: Jack McCall, retired gangster, former head of crime operation in state now a successful rancher, is to be called to testify before a grand jury, investigating crime in the state. Mathews is assigned to the job of keeping McCall safe. McCall refuses to be placed in a hotel for safety, so Mathews goes to the ranch. The first attempt on McCall's life is by a sniper. The second by explosives placed in a truckload of Alfalfa. The third, a bomb through the mail. Mathews sets up air-tight precautions. The head of the crime setup in the state puts on a head-on assault to kill McCall. They attack, a gun fight results, and the intruders are captured. McCall now says he'll testify. The sight of a cop fighting to keep him alive, just because it's his job, has convinced him that this side of the law has much to commend it.